Develop IEP goals and provide accommodations that address student deficits while preserving the rigor of new standards. Plan and implement professional development for special education staff. Create IEPs and write IEP goals that align with CCSS. Use technology tools to help special education students access the CCSS. Plan project-based learning lessons within special education pull-out settings. Assess and strengthen students’ academic vocabulary and executive functioning skills. The Common Core State Standards are here, and you need a clear and comprehensive plan to align IEPs and pupil services with them. Get hands-on guidance in this new resource, the first to provide thorough Common Core guidelines and staff development tools for special educators. 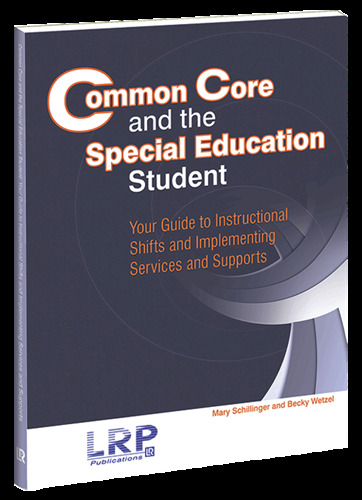 Plus, this complete book comes loaded with sample Common Core-aligned IEP goals, goal-writing worksheets and templates, sample professional development agendas, guiding questions for considering CCSS’s impact on special education, and other practical resources.